MIGHTY Sports defeated Euro-Med, 98-87, on Wednesday to advance to the finals of the PCBL Chairman’s Cup at the Marikina Sports Center. Bright Akhuetie had 33 points and 14 rebounds while Kiefer Ravena came straight from Gilas Pilipinas practice to add 17 points, including 12 in the second quarter, as Mighty completed a sweep of the best-of-three semifinal series. Ravena dropped back-to-back triples in the second quarter that allowed Mighty Sports to get its first taste of the lead, 41-40. 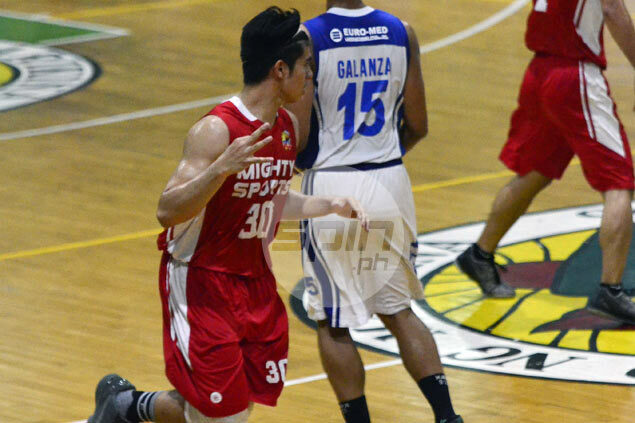 Mighty Sports ended the first half with a 51-42 halftime lead after outscoring Euro-Med, 32-13. The Game Two victory put an anti-climactic end to a semifinal series that began tumultuously after Euro-Med’s Ola Adeogun hit Mighty Sports’ Kevin Ferrer at the end of Game One over the weekend in Malolos City. Adeogun was slapped suspended for Game Two after incurring a second technical foul for the conference for disrespecting game officials. Mighty Sports coach Mike Fermin said his wards never lost focus despite the controversy. Eric Salamat had 15 points for Euro-Med, which lost a 29-19 first quarter lead. Mighty Sports (98) — Akhuetie 33, Ravena 17, Banal 13, Wongchuking 6, Montilla 6, Melocoton 5, A. Bringas 4, M. Bringas 4, Tang 3, Celada 3, Lopez 2, Mangahas 2, Ferrer 0, Regalado 0. Euro-Med (87) — Salamat 15, Alvarez 13, Almario 11, Salcedo 8, Gil 8, Custodio 7, Llagas 6, Poligrates 6, Saitanan 6, Tajonera 3, Galanza 2, Parala 2, Capacio 0. Quarters: 19-29, 51-42, 83-59, 98-87.